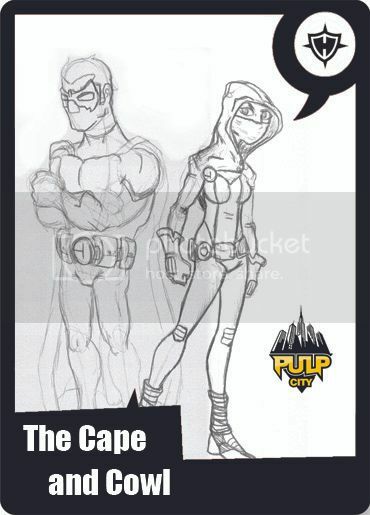 The goal of this issue is to produce a set of two masked vigilantes that defend Pulp City from all threats. You may enter as many Supremes as you want. The more detailed the description, the higher your chances of winning. We?ll be looking first at the background and powers, possibly artwork, then the rules. You are welcomed to provide all of above or leave out some. Mind that the box content may be based on entries of two different people. Allegiance: Heroes or Heroes/Villains, no subfaction. Race: Human, earth-loving alien, conscious robot ? pretty much anything wanting to fight for Pulp City. Powers: Low level powers, gadgetry, stealth, acrobatics, rooftop running. Attitude: Loners or a vigilante duo, defenders of the neighborhood, night fighters, possibly hunted by cops, not accepted by the authorities, loved by citizens. What?s in for you: Credit in the Heroes & Villains section, 3 copies of your Supreme miniature. If you provide art and the art is of level equal or higher (Pulp Ministers is the judge, blame him) to current Pulp City card/box art, you also get 30 Euro for lineart or 45 Euro for full color art. All entries must be turned in by the end of 09/15/2009 (Pacific Time) at supremegenesis (at) pulpmonsters.com. By entering the contest you acknowledge, that in the case of your entry winning, the IP involved (including art) may be used by Pulp Monsters in any way. Woo hoo! I'm so on this! After all, this is my favorite type of character from back when I read comics on a regular basis. I was hoping that htere would be the option for 3 charcters in this category as I have conceived a selection already, but what i have in mind should work with two. Send it 3 characters. We'll be choosing 2 but the more the better. Two make a more obvious pairing out of the three, so i'll probably sumit as two with details of the third for interests sake. I already have most of my 'bits' for conversion for one so I have a model I can try out rules with as soon as my scenery is up and together. Very much looking forwards to these two competitions. Are you asking specifically for a male and a female or any combo? My concept is based on two males though if needed could be adjusted. The reason I ask for at least one female is that we are still lacking few in the city! I could see two males but ruleswise, we want at least one female in the categoru. Off course you can enter two males and one of them may end up as a winner! I'm collaborating with a friend of mine on my entries for this contest. He just emailed me some sketches and I'm really psyched up. My friend and I are collaborating as well. The sketches were done by my very good friend Alex. Last edited by redstripe on Wed Aug 19, 2009 9:35 pm, edited 1 time in total. The image link isn't working, but I'd love to see them.